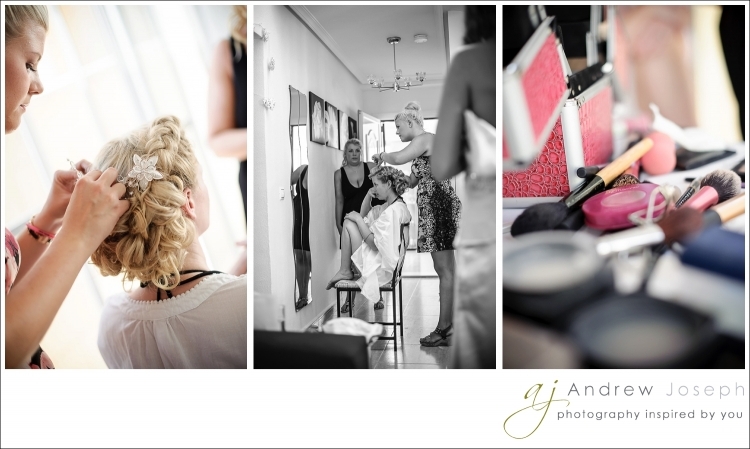 The big day of Suzanne and Omar in Rebate started with bridal prep shots in Balsicas, in the Murcia region. When I walked in Charlie Smith was doing the hair and makeup. Perfect timing to grab some of these prep shots! Charlie did a fab job for Suzanne. After the prep shots I quickly hopped in the car to drive to the venue, Rebate for a 5p, service. As soon as I got to Rebate, the guests started arriving. The team at Rebate had organised coaches to collect all the guests at their hotel and the coaches would also take them back at the end of the evening. Suzanne arrived in the wedding car,..just in time for the ceremony (even though the weddings held at Rebate always run on time, the bride is allowed to be fashionably late). The service was conducted by Eddie Martens, Rebates house reverend. As usual his jokes and anecdotes were received well by al the wedding guests. I have said it once and I will say it again, Eddie should have been a standup comedian! His services are really something. The ceremony lasted approximately 30 minutes. After that Omar and Suzanne signed the wedding certificate and walked out to their favourite music. Once outside all the guest had confetti ready for the confetti shot. Right after the ceremony I do not go into formal shots. First things first: a nice cool drink! Their guests only have 1,5 hour to relax, have a drink, a nibble, a chat and enjoy the surroundings. I always try and keep the formal shots to a minimum unless the couple want more. In general the formal shots don´t last longer than 15-25 mins. While the guest are being moved to the dining area, I grab a quick 15 mins with the bride and groom to take some photos of the two of them. Without the guests present I have noticed that the bride and groom are more comfortable when a camera is pointed at them. Most couples tell me that they are terrible on camera and that they don´t do posed shots. I always tell them the truth: they will be absolutely fine. They are in good hands – I have done ´a couple´ of weddings you know? Any directions will be giving and the resulting images are always great. After their bride and groom shots we made our way to the dining area. In this case, Suzanne and Omar chose to have their wedding meal outdoors. Nothing nicer for your guests than to be able to dine outside in Spain! Before the starters came out Omar, father of the bride and the best man gave a short speech. The bride, groom and their guests had a fantastic day at Rebate!